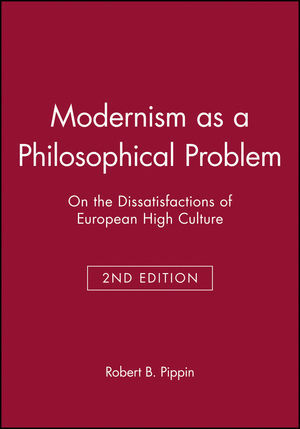 Modernism as a Philosophical Problem, 2e presents a new interpretation of the negative and critical self-understanding characteristic of much European high culture since romanticism and especially since Nietzsche, and answers the question of why the issue of modernity became a philosophical problem in European tradition. Robert B. Pippin is the Raymond W. and Martha Hilpert Gruner Distinguished Service Professor in the Committee on Social Thought and the Department of Philosophy at the University of Chicago. He is the author of several books on the modern philosophical tradition and one on literature, Henry James and Modern Moral Life (1999), as well as numerous articles on similar topics. Part I: Introduction: The Modernity Problem. Part II: Modernity and Modernism. 3. Modernity as a Historical Category. 5. The 'Culture of Rupture'. Part III: Idealism and Modernity. 8. The Limits of Transcendental Idealism. Part IV: "Nihilism Stands at the Door": Nietzsche. 12. Modernity as 'Twilight' Zone. 14. The 'Pathos of Distance'. Part V: "The Age of Consummate Meaninglessness": Heidegger. 16. Modernity as a 'Metaphysical' Problem. 17. The 'Vollendung' of Metaphysics. 18. The Turn, Turning Away, and Overturning. Part VI: The Death of God and Modern Melancholy. 24. The Dialetic of Modernity. * The second edition contains a new introduction discussing the current state of the modernity controversy, and an additional chapter, entitled, Nietzsche and the Melancholy of Modernity. * The second edition of a book that has become a standard text to which many references in literature are made. * Represents a distinctive interpretation of modernity: the author develops an original argument against Nietzschean and Heideggerean claims about a "nihilistic" end to the modern tradition, and defends a reconsideration of many of Hegel's original claims about the nature and potential "completion" of modernity. * Takes the reader on an adventurous voyage through the authentic thinking of Hegel without repeating all the conventional wisdom. * Identifies the most important claims made on behalf of modern philosophy, and the most important objections to have emerged against those claims. * Combines analytical precision and broad speculative powers.